Richard Halleron reflects on a successful trade mission to China and Ireland’s prospects for reaching into its market. • imports – 10 million tonnes. “But these figures do not add up,” I hear you say. Well, in fact, they do given that almost 20 per cent of the milk produced in that country (8 million tonnes) is deemed not to be suitable for human consumption. And therein lies the opportunity for Ireland moving forward. I recently spent a week in China, visiting dairy processing operations the length and breadth of the country as part of a Bord Bía trade mission, headed up by Agriculture Minister Simon Coveney. To a man, each of the Chinese company executives I spoke to confirmed that their own consumers have major concerns regarding the quality of the milk produced by local farmers. The most obvious example of this can be seen within the lucrative infant milk formula market. Product sourced from Ireland, for example, will sell for up to four times more than comparable milk powders made from locally sourced raw materials. The reality is that Chinese parents, quite rightly, view the nutrition of their children as being of paramount importance. And, increasingly, they are looking to Ireland as a source of dairy products which they regard as being safe to eat and of the quality they want. And the same principle also holds where other foods are concerned, including pork and poultry. 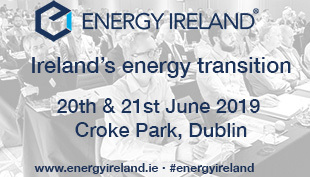 The good news is that the food traceability measures now operating in Ireland and the drive behind Origin Green will provide Chinese consumers with the reassurances they need when it comes to the food they eat. China is home to 1.3 billion people. Even the briefest of visits to places like Beijing and Shanghai will confirm the growing wealth of the middle classes in these cities. At the present time, the ‘in thing’ to do in all China’s major centres of population is to go out for the evening and enjoy a steak dinner. Wouldn’t it be great if even a small fraction of that meat could come from Ireland? 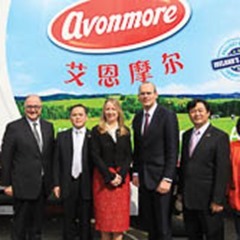 The closer relationships that have been secured between Irish food companies and their Chinese trade counterparts must be built on as a matter of priority, according to Minister Coveney. Speaking at a breakfast hosted by Bord Bía to officially close the Irish trade delegation mission to China, he said that, in practical terms, this meant ensuring that similar initiatives must now be hosted on an annual basis. 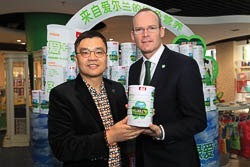 “China has the potential to become Ireland’s largest agri-food market,” Coveney added. “And the sooner this happens, the better. This week has been marked by a number of landmark developments, chief among them being the decision by the Chinese Government to push ahead with official veterinary inspections of Irish beef processing plants next month. But there has also been tremendous progress made by Irish dairy and pigmeat processing companies this week in forging closer ties with the Chinese market. Irish agri-businesses wanting to develop opportunities in China must have a presence on the ground, according to Alltech Director Mark Lyons. Speaking to eolas at an official reception hosted by Minister Coveney and Ireland’s Ambassador to China, Paul Kavanagh, for Chinese agri-food leaders, the Alltech representative also pointed to the extremely fast moving pace at which the various business sectors within China are developing. Lyons remarked: “We have been very open in allowing our products to be trialled independently under commercial farming conditions in China. At one level, this comes with an inherent risk but the potential pay-off in taking this approach is more than considerable.” Mark Lyons also pointed to the tremendous potential for growth within China’s agri-production sector. “The scale of the industry is breath-taking,” he commented. “The Chinese Government is committed to delivering higher levels of food security over the coming years. In practical terms, this means harnessing and utilising the latest thinking and technologies across the entire spectrum of animal breeding, husbandry and nutrition. And it is in this context that Irish agri-businesses can play a key role. The launch of the ‘Green Love Plus’ infant milk formula brand represents the start of a new and exciting business opportunity in China for the Kerry Group, according to the organisation’s CEO for Asia, Edmond Scanlon. ‘Green Love Plus’ will be sold by the Beingmate company, China’s foremost retailer of infant formula and associated nutritional products for children. The launch event (pictured above) was held in the Chinese city of Hang Zhoa with Minister Coveney in attendance. The Kerry representative also confirmed that the company has plans to develop similar products with a range of other retail consortia, all aimed at the infant nutrition market throughout Asia. “This is phase one of an exciting project for the group as whole,” Scanlon continued. “We are also targeting markets in the Middle East and Africa.” Beingmate General Manager Huang Tao explained that Green Love Plus will be sold throughout China courtesy of the company’s 100-strong team of distributors.